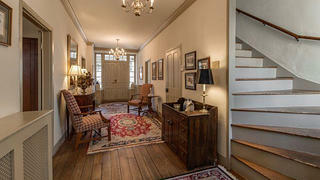 Built during the American Revolution, I have played witness to three centuries of American history. I'm built in an early Federal Style, which was a new take on styles of Antiquity recently rediscovered at Pompeii and Herculaneum. The Federal Style lent an air of importance to many significant buildings from my era, and fostered the professionalization of the architecture field. I was built near an original portion of the Old Columbia Turnpike, which was constructed in the early 18th century as a link between what became Ellicott City, Maryland, and Georgetown in Washington, D.C. Because of this strategic placement along this busy road, I was named “Wayside Inn,” a name I use to this day. 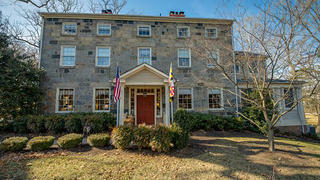 It’s even rumored that George Washington and John Quincy Adams once stayed here! 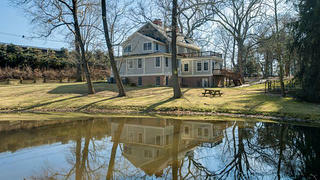 I’m on just under 2 acres of rustically beautiful landscape, which includes a carriage house and a charming pond. At four stories, I feature seven bedrooms and bathrooms and two powder rooms. Despite my spaciousness, I suspect my winter heating bills are manageable, thanks to my 10 fireplaces with original mantles. I’m solidly built out of 20-inch stone walls, with heart pine wood floors. I’m organized around a grand center hall with a wide staircase. I retain many of my historic details, including deep window sills and hand-molded wood trim. I currently operate as a bed-and-breakfast with six suites, but due to my flexible zoning I have many potential uses. I have been lovingly cared for and restored, and my modern wing at the rear doesn't feel disjointed from the rest of me. I’m known around Ellicott City as the house with candles always burning in the windows, which is the historic equivalent of a vacancy sign. Ellicott City is a perfectly-distanced jaunt from either Washington, D.C., or Baltimore, and hosts many historic tourism opportunities. Learn more about me here and partake in a video tour of me here. On just under 2 acres with a scenic pond, I offer prime picnic locations. My central hall plan is indicative of the period I was built in, and it makes perfect organizational sense for an inn!